Disclaimer: I did not take this photo. I forgot to take one. So this is curtesy of iStockPhoto. But I did serve Asparagus. And a Salad. And the roast did look like this. Really. First, i want to announce the winner for Stephanie O’Dea’s More Make It Fast, Cook It Slow Cookbook. Using Random.Org, the lucky winner is: #72 Helen!!! Congratulations, Helen. I will email you directly to get your contact information. Now…I had planned on doing another review and giveaway today, but because we just returned from an amazing week of skiing in Deer Valley, Utah, I have not quite gotten my act together yet to give my review of Diane Eblin’s book, The Gluten Free Diner, it’s proper due. I love that lady. I really do. I wish she was part of my family. Well, I will re-phrase that. I actually feel like she already is. And, I want to make sure I can devote the right amount of time to try and portray to you how awesome that she and her E-book really are. So her review will be going up next Thursday. Right now, my house is in it’s typical state of post-vacation dis-aray – laundry piles waiting in line for their turn at a whirl in our dirt collector, a refrigerator sitting relatively empty, and a pile of mail that hopefully is harboring happy news on top of all of those sad and lonely bills. All of that, however, waited patiently as I prepared for one of my favorite gluten free blogging friends to show up on my doorstep. Shirley Braden, of gfe-gluten-free easily, and her husband, Mr. GFE (and incidentally one of the sweetest and kindest men in the world) just came for an overnight visit while on an adventure for the books that involved helping a friend move from Virginia to Arizona. To hear them tell the stories of driving the Monster Truck (and that is the nice name), filled to the rim, across the country on what was SUPPOSED to be a 3 day excursion, it makes you wonder how they even made it to our desert state alive. Shirley started a slight run-down of their antics on her most recent blog post involving the top 10 GFE Discussion Posts. So far she has shared a Giant Peach (and yes, she swears that is what it really is), a poisonous meal, and the truck that nearly killed them. I cannot tell you in words what a wonderful time our family had with the GFE couple. They are such an incredible hoot to hang with and we just had so much fun. My boys fell in love with them, and my littlest took an immediately liking to Mr. GFE! In fact, I am a little surprised that he was not hiding in his suitcase this morning as they headed off to the airport. They were perfect house guests. And, if they had just done my laundry, filled my refrigerator, and sorted my mail, I think I would have invited them to live with us forever. So, today, I will leave you with the easiest Prime Rib Recipe ever, and, incidentally, also what I served for dinner last night. And although I really meant to take a photo of our meal, I was having just too much fun to stop and disrupt the moment. But, the photo above looks just like our dinner did. I promise. 2. Combine all spices in a bowl. Press mixture evenly over entire roast on all sides. 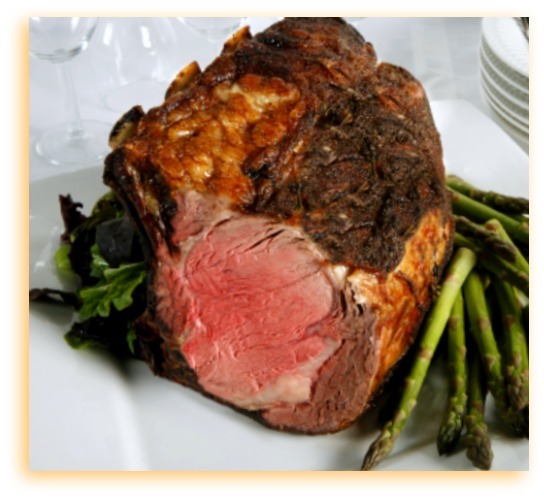 Place roast in large roasting pan on a rack. 3. Insert an oven safe digital thermometer into the center of the roast. Place pan in oven at 450 degrees for 25-30 minutes. You may want to check and make sure roast is not browning too quickly. You can cover loosely with foil if so. 4. Lower temperature to 350 degrees and continue cooking until thermometer reaches about 128-130 for medium rare or 135-140 for medium, about 45 minutes to 1 hour longer. 5. Remove from oven and let sit for at least 20 minutes before carving. I saw that roast and thought hmmm, Kim must have been so excited to see Shirley that she wasn’t paying her usual attention to the photography. Meow. Really, your pics have been so good and so much better than that stock photo. Sounds like you had a great time with Mr. and Mrs. GFE. Speaking of Diane, we just finished her Mini Buffalo Chicken Burgers for dinner. The kids had three each. On buns. LOL~ Wendy, you crack me up!!! That lovely compliment is too darn sweet! teehee. We really did have a great time together, even though it went by way too quickly. Those mini buffalo chicken burgers sound awesome! Did you make the buns? I made her pesto chicken salad yesterday and I think I am going to make the sesame ginger chicken wings and the bacon wrapped avocado tomorrow. I’ve been wanting to try Diane’s sesame ginger wings and I don’t even like wings that much. The buns are Schar ciabattas. They make great mini burger buns. Oooh, wish I had been there, too! Sounds like you had a great time. And I totally agree with Wendy. That does NOT look like a Kim photo. Yours are so much better. Seriously! Thanks Melissa! I love that you think my photography skills are better than the pic posted here. Now, I just have to get a new tripod after my last catastrophe where it fell and broke. I am feeling very lost without it. Hi Intolerant Chef!! I love the sound of the Cattlemans Cutlets – that sounds delicious! They must be so nice and juicy when you make them that way! 😉 Yummo! I actually love the fact that you forgot to take a photo – sometimes as food bloggers we get so caught up in trying to capture the moments we don’t get to enjoy the moments! Glad you had a lovely visit with Shirley, you are two of my favorite people! Big smooches to you and your family, Kim! Shirley…you are so so sweet!! I enjoyed every minute with you, but like you said, when it was just us in the kitchen and sitting on the couch, it was absolutely perfect. And I kid you not, Carson woke up AGAIN this morning and said, “Remember when Smokey and Shirley were here. That was so fun wasn’t it, Mom?” I cannot wait to see you all of the other times we have in store for this year. 2011 is going to be amazing! Thanks again for the wonderful company! We miss you! Waw!! That roasted prime rib looks ooh so tasty!! My husband would love this because he is a real beef eater. I don’t like beef. I will show hime your picture & I will tell you , He will be drooling,…!!! Kisses from Brussels to you, my friend!